Vail native Mike Johnston in his element (photo courtesy of Johnston campaign). 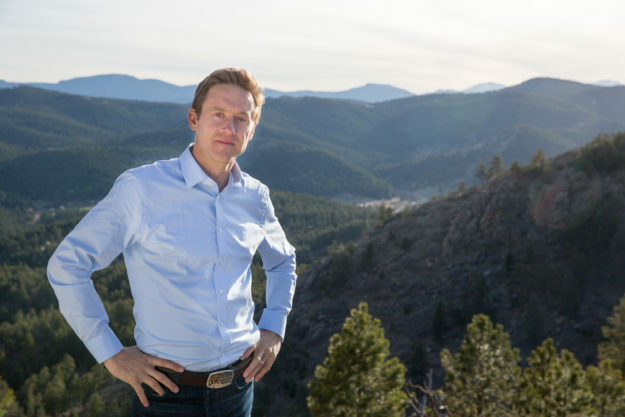 SILVERTHORNE, Colo. — Vail native and former state Sen. Mike Johnston says he’s the only Democrat in a crowded Colorado governor’s race for his party’s nomination in the June 26 primary who owns guns and knows how to use them. But rather than head to the local gun range or sporting clays shooting park, Johnston prefers to fire off a few salvos of reasonable dialogue on a topic that’s come to define his campaign. And he wants to engage the people he says need the most convincing when it comes to additional guns laws – members of the National Rifle Association. Those are the folks Johnston is inviting to what he’s calling a “family dinner” at Coohills restaurant in downtown Denver on Wednesday, May 30: veterans, police officers, shooting survivors, gun-control advocates and NRA members. No politicians or policymakers … other than Johnston. Regular folks like the ones he met May 19 at a Friends of the NRA fundraiser in Silverthorne. Johnston skipped a gun-control debate on the Front Range that night where no Republicans or NRA members were expected to attend, instead heading up to the mountains to talk gun rights. Three of the first four NRA members he talked to that night at the Central Rockies Friends of the NRA banquet at Blue River Pavilion supported some form of red-flag legislation to temporarily take guns away from people with mental health issues who pose a threat to themselves or others. A bipartisan red-flag law garnered the support of local and statewide law enforcement earlier this month, passing out of the Democrat-controlled House before being killed in the Republican-controlled Senate. The red-flag concept is part of Johnston’s #4NoMore gun-safety plank. Lyle Sidener, a Kremmling resident who attended the May 19 Friends of the NRA event in Silverthorne, says he’s worried about due process in any kind of red-flag law and how best to protect law-abiding gun owners from possible abuse. Still, he realizes something needs to change. A game warden supervisor for Colorado Parks and Wildlife, Sidener says the Central Rockies chapter of Friends of the NRA has raised a great deal of money for youth shooting and hunting programs through ROTC, 4-H, Boys Scouts and other organizations. He doesn’t want to see laws that in any way infringe on legitimate gun ownership for sports and hunting. “I hate to see something like that restrict what a law-abiding person is doing — whether it’s a hunter or a shooting-sports advocate or someone like that – to have their rights infringed upon because the existing system is not protecting us in those instances,” Sidener added. Johnston said red-flag laws have more support than some of the gun laws passed by the Colorado Legislature in 2013 in the wake of the Newtown and Aurora theater shootings. Nationally, the NRA has signaled some openness to limited red-flag laws. Peggy Long, a past chairwoman of Central Rockies NRA and the current treasurer, said her group really works hard to stay out of the political fray. Long said the May 19 event was sold out and raised the most money ever, with “a lot of happy faces leaving the room.” While she did not see or talk to Johnston, Long said a Denver reporter was asked to leave the event, and there was also an incident with a Republican attendee. Johnston said he was cognizant of the local chapter’s admonition against politicizing guns. Editor’s note: A version of this story first appeared in the Vail Daily.